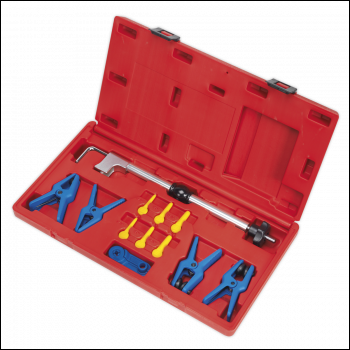 Comprehensive kit designed to stop the flow of fuel from fuel lines after disconnection. Comprises long reach flexi-hose clamp, fuel pipe separator, six fuel hose plugs and four fuel supply adaptor clamps with rubber bungs, suitable for banjo and metal fuel pipes. Compatible with brake, transmission, fuel lines and other applications. 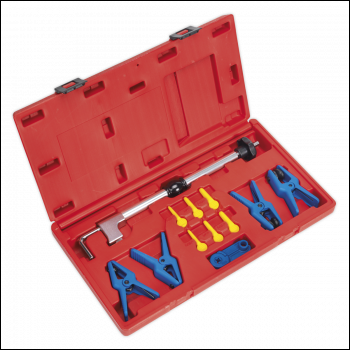 Comprehensive kit designed to stop the flow of fuel from fuel lines after disconnection. Comprises long reach flexi-hose clamp, fuel pipe separator, six fuel hose plugs and four fuel supply adaptor clamps with rubber bungs, suitable for banjo and metal fuel pipes. 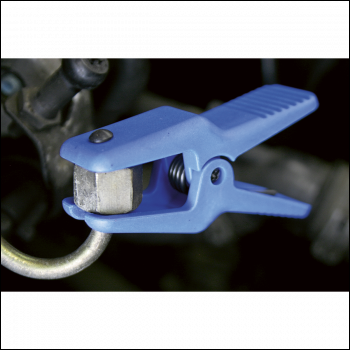 Compatible with brake, transmission, fuel lines and other applications. Contents: Long Reach Hose Clamp, Fuel Pipe Separator, Clamp (Metal Fuel Pipe) (x2), Clamp (Banjo Fitting) (x2), Plugs (2 of each); 3/16", 1/4", 5/16"